So my ‘Deadpool Kills The Marvel Universe’ statue is under way, and it will be done in X-Force version (white), I was looking for a Red Deadpool, initially I tough about getting the Sideshow exclusive one, but those are always done in over 1000 series, and between exclusive and non exclusive, goes to close to 2000 per serie, so not that exclusive, as such I decided to start getting my statues only from small independent studios, for once you are supporting the real artists and second they are rarer and more personal. 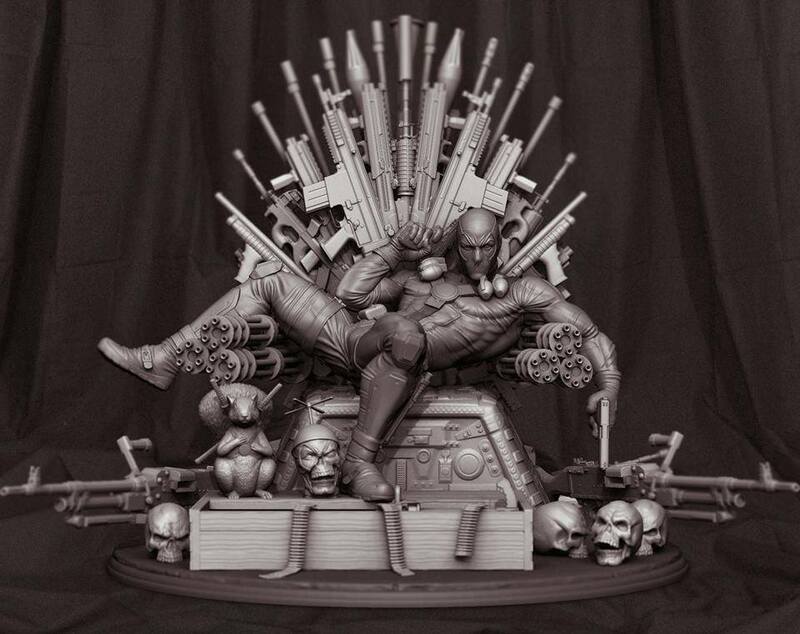 So after a friend of mine told me about it, I decided to go for The Art Department’s upcoming ‘Game of Deadpool’ statue, sculptured by Guillermo Empinado, it will be a few months before it’s done, but will be worth the wait :), and of course it’s ¼ scale, the size I have settled in for all my future statues. I also seem to be favouring these “throne” style statues, with less of a museum pose. Finally I will get a cool Red Deadpool statue worthy of the character. Hello, I am very interested in purchasing one of these statues. Can you point me in the right direction on how I would go about getting one? Thank you! Sorry Gina, they are actually sold out, I actually ended up selling mine to a fellow collector.